Year Three of open enrollment for private health insurance plans starts Sunday. MNsure officials expect to be busier than ever. 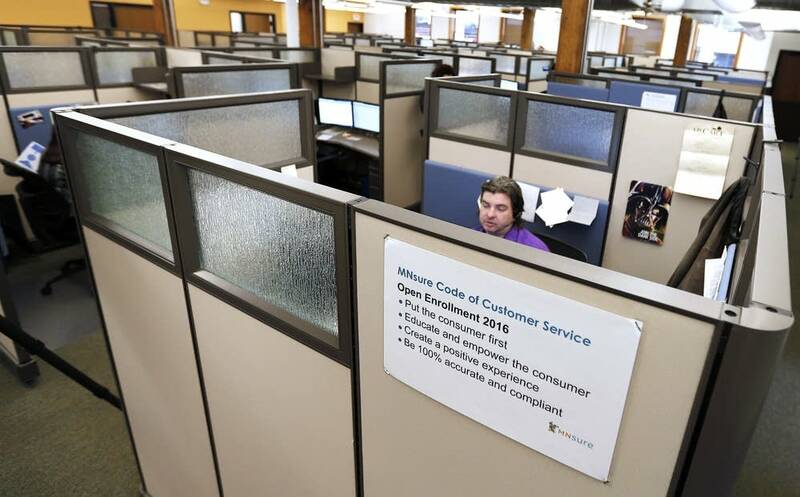 Unlike last year, there's not much speculation this year about whether the state's online health insurance marketplace will crash, or whether its call center will have unacceptably long wait times. MNsure turned in a respectable performance a year ago following a disastrous open enrollment in Year One. And now that the worst of MNsure's technical issues appear to be resolved, there's more focus on the mission to get uninsured Minnesotans covered. Since taking over as interim CEO, Allison O'Toole has traveled the state thanking groups that are helping people sign up. During a recent stop at a community center in Minneapolis, O'Toole heard about efforts to reach out to people who need coverage. "We go to each mosque at different times," said Amano Dube, director of the center. "We have dozens of people we can enroll right there. And there are community organizations, cultural community groups that have community centers or offices where they gather; those are other locations we could go." Back at her downtown St. Paul office, O'Toole acknowledged the importance of working with a variety of community groups to sign up the roughly 5 percent of Minnesotans who lack coverage. "We are partnering with trusted community organizations that have relationships with folks that we don't normally cross paths with," she said. O'Toole expects MNsure will be busier than it's ever been, in large part because individual market insurance rates are going up for next year — some by almost 50 percent. That means many more Minnesotans will qualify for tax subsidies, which are available only through MNsure. "We don't want consumers to leave money on the table this year," she said. "When premiums increase — it's sort of counter-intuitive, but the tax credits increase as well." And the penalty for not having insurance next year is more than doubling, to almost $700 per adult or 2.5 percent of household income — whichever is greater. Consumers who use MNsure's website will soon find a comparison shopping tool that the nonprofit group Consumer's CHECKBOOK developed decades ago and is adapting for some state exchanges. Robert Krughoff, the founder and president of the company, explained how his software works. It looks easy to use and it's quick. Enter some information — your age, general health, whether you anticipate an expensive procedure such as knee replacement — and the software figures out what your health care needs are likely to be. The estimate is based primarily on heaps of federal health care data. The list of plans is not sorted by premium or deductible but rather by the average total cost estimate. Krughoff said he chose total-cost sorting as the default in hopes of helping people avoid a common pitfall of health insurance shopping. "Consumers tend to choose based on premium alone, or deductible alone," he said, "and none of those short cuts will give you the right answer reliably for you." Krughoff's comparison shopping tool won't be online for the first day of open enrollment but will likely be available sometime next week. For those who prefer one-on-one help, there's also a searchable "assister" data base on MNsure's website.